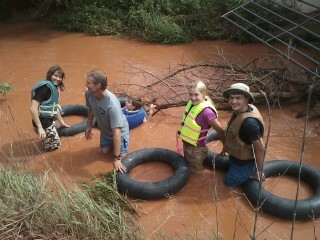 When God delivered 5 inches of rain in 3 days last week our river rose & Chelsa came up with a great idea. So, we inflated 6 tractor inner tubes that PaKing had gotten for us, put on our swimming stuff & drove to a bridge about a mile west of our house to unload. As Sierra drove the truck back to the house the rest of us jumped in the Clear Fork of the Brazos with our tubes & headed for the Gulf of Mexico. It was a blast. New Braunfels has nothing on Abilene. There were twists, turns, whitewater, and a fallen tree to slide under. We had so much fun we talked Sierra into going with us for another 30 minute ride. The next day we got even more adventurous. Chelsa & I drove to another bridge east of our house to drop off a car so we could ride back home after our tubing trip. We excitedly jumped into the river & headed downstream, absentmindedly noticing that the river wasn't flowing near as fast as the day before. After almost 2 hours of fun I started to wonder how much farther it was to the bridge. Those concerns were soon outweighed when I saw a 100 foot log jam ahead. It seems a farmer had cabled fence panels across the river & the driftwood was getting hung up. We eventually decided to try to walk across the logs, and to my amazement, it worked! After 3 hours on the river we came to the bridge with sunburned shins, hungry bellies & a lot of stories. Believe it or not, I was attacked 3 times by a 12 inch gar! It went air born each time, jumping out of the water toward me; making direct contact twice. Once on my ear. When a gar jumps at you one time, that's random. Twice is a coincidence. But three times; that's called stalking. We can't wait for the next big rain.